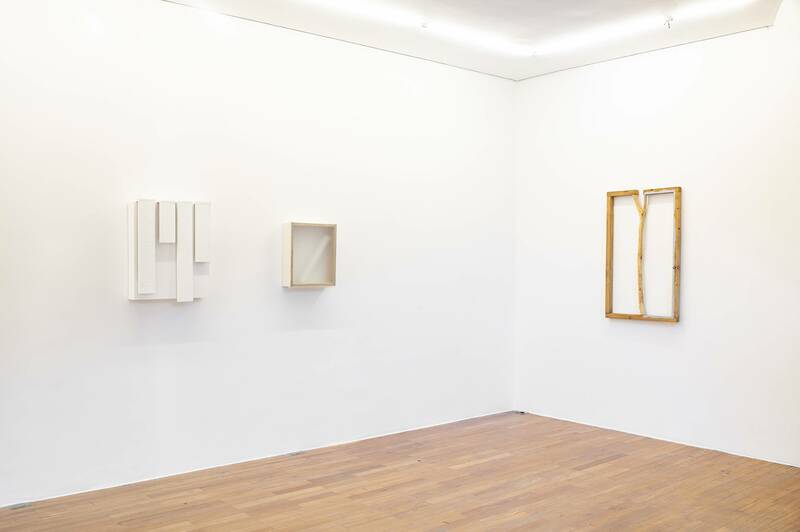 Mendes Wood DM São Paulo is pleased to present the japanese artist Kishio Suga’s first solo exhibition in Brazil. Kishio Suga is one of Japan’s most celebrated artists, whose diverse and influential practice spans site-specific installation, assemblage, and performance. Suga, just as the whole generation of artists his period came to reflect the tensions in a society in the midst of post-war changes. His career began in 1968, when he started making ephemeral installations out of natural and industrial materials such as wood, metal, wire, and concrete. He quickly gained recognition for works such as Parallel Strata (1969), a rectangular enclosure constructed out of slabs of paraffin wax. 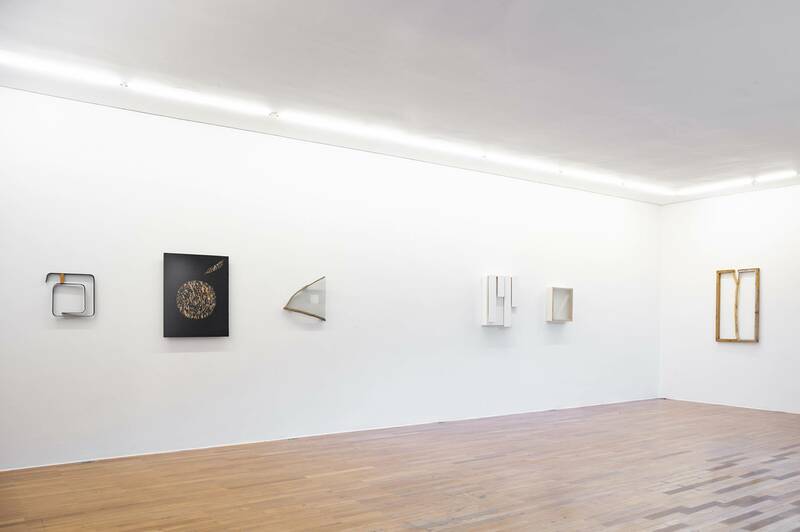 By introducing an incongruous yet defined structure of raw material into the gallery space, he sought to reveal the reality of mono (things/materials), and the jōkyō (situation) that holds them together. With these installations and influential essays such as The Start of Disappearance: As Things Deny Things (1969) and Existence Beyond Condition (1970), Suga was identified as a key theorist within a loose group of like-minded artists that later came to be known as Mono-ha (School of Things). Though short-lived, this movement was a major turning point in postwar Japanese art history, echoing the concurrent development of Land Art, Arte Povera, and Supports/Surfaces in the United States and Europe, yet rooted in a specifically Japanese intellectual and cultural context. 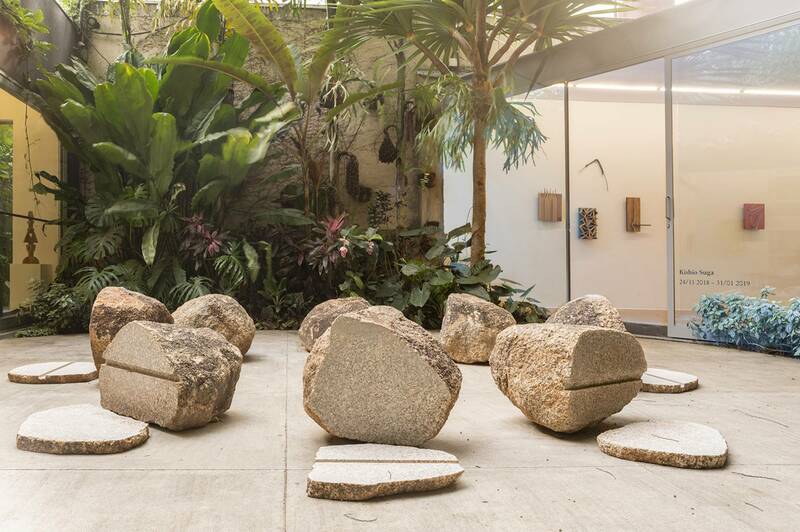 In the gallery’s central courtyard is Sliced Stones (2018), an installation specially commissioned for this space. 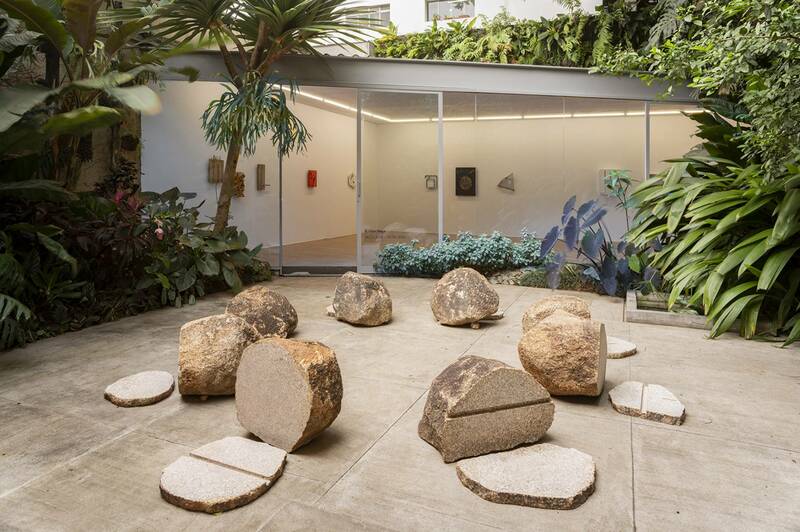 Eight rocks have been arranged in a circle and cut to expose the contrast of their rough exterior surfaces with the smoothness of the interior. A single linear incision running horizontally across the sliced faces of the stones unites these disparate units into a single holistic situation. 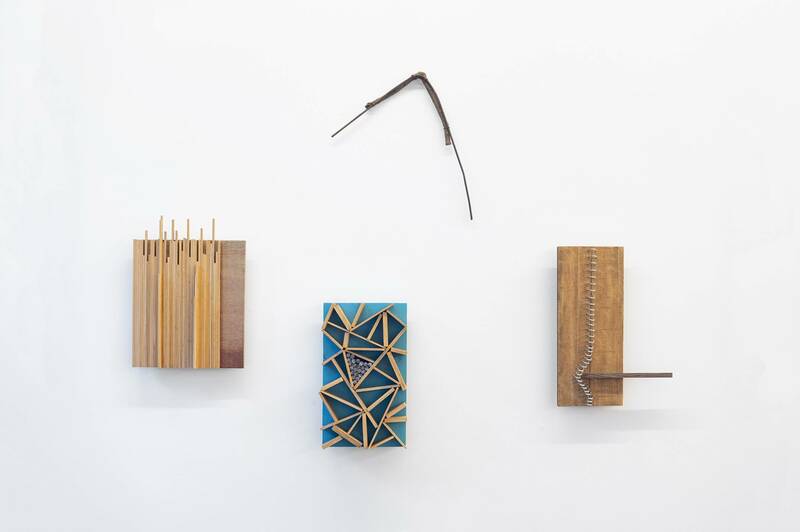 In tandem with his installation practice, Suga has also made assemblages out of wood, metal, paint, mesh, stone, paper, and innumerable other materials. This exhibition presents a wide range of these small-scale reliefs. In these compositions, as in his site-specific installations, Suga explores the act of establishing boundaries only to disrupt them. Kishio Suga was born in Morioka, Iwate Prefecture, in 1944, and lives and works in Ito, Shizuoka Prefecture. His recent solo exhibitions include: Pirelli HangarBicocca, Milan (2016); Dia: Chelsea, New York (2016); and the Museum of Contemporary Art, Tokyo (2015). He is frequently included in global survey exhibitions. A re-creation of his groundbreaking outdoor installation Law of Situation (1971) was featured in the Gaggiandre shipyard at the 57th Venice Biennale until November 26, 2017, and his work was included in Japanorama. New vision on art since 1970 at the Centre Pompidou Metz (2018). 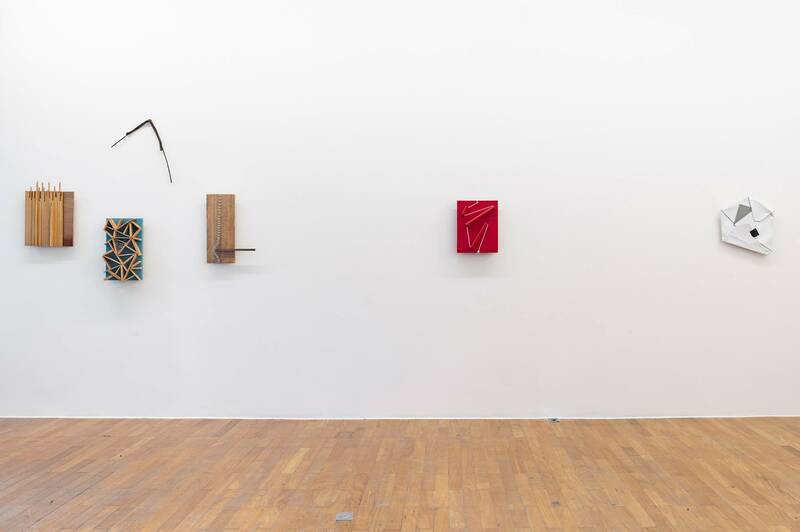 Recent group shows includ: The Emergence of the Contemporary: Avant-Garde Art in Japan 1950–1970, Imperial Palace, Rio de Janeiro (2016); Karla Black and Kishio Suga: A New Order at the Scottish National Gallery of Modern Art, Edinburgh (2016); Prima Materia, Punta della Dogana, Venice (2013); Parallel Views: Italian and Japanese Art from the 1950s, 60s, and 70s, The Warehouse, Dallas (2013); and Tokyo 1955-1970: A New Avant-Garde, Museum of Modern Art, New York (2012). His work is featured in many institutional collections, including the Centre Pompidou-Metz, Metz, France; Dallas Museum of Art, Dallas; Dia Art Foundation, New York; Glenstone Foundation, Potomac, MD; Guggenheim Abu Dhabi, Abu Dhabi; Long Museum, Shanghai; M+, Hong Kong; Museum of Contemporary Art, Tokyo; National Museum of Art, Osaka, Japan; National Museum of Modern Art, Tokyo; Pinault Collection, Venice; Rachofsky Collection, Dallas; Tate Modern, London; Tokyo Metropolitan Art Museum, Tokyo; and the Yokohama Museum of Art, Yokohama, Japan.